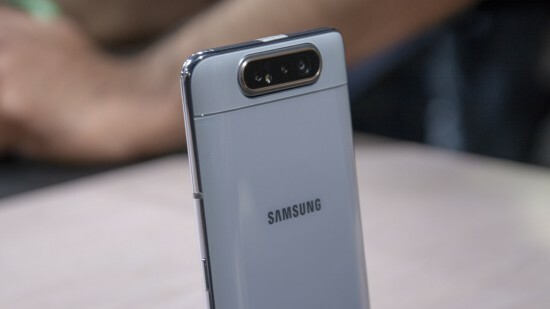 Samsung is the leading smart phone manufacturing company, which has announced the smart phone, Samsung Galaxy A80 and this handset is provided with rotating triple sensor camera to double as selfie and rear camera. The company has made the technological innovation with its triple camera and this premier mid-ranger had done the debut of the new infinity display. Samsung Galaxy A80 48 MP rotating triple cameras smart phone. The smart phone has the brushed metallic look and it has triple sensor rotating cameras. The mobile phone has curved glass, which is installed on both sides of the phone. This smart phone is provided in the market in three colors including angel gold, phantom black and ghost white. The users will find the fingerprint sensor in the display. Samsung Galaxy has the features of 6.7 inches Super AMOLED display and has Sony esque 20:9 aspect ratio. The screen of the mobile phone has no notch or punch hole to distract it from full screen bezelless display. But this smart phone is not water or dust resistant and it does not have stereo speakers or headphone jack. The smart phone, galaxy A80 is the first smart phone, which is using Qualcomm snapdragon 730 chip and it has octa core processor with 2 x Kryo 460 gold cores, which are working at 2.2 GHz and the Adreno 618 produces graphics. This mobile phone has one variant with 8 GB RAM and 128 GB internal storage and there is no microSD card slot in it to increase the memory. 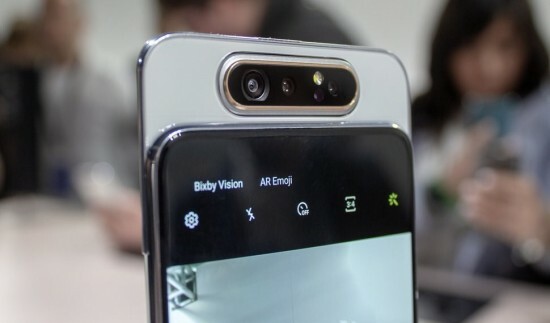 This mobile phone has the main rotating camera, which is 48 MP and ithas 8 MP camera, which is ultra wide sensor with 123 degree FOV and the third time flight sensor. It has rotating camera to make wonderful pictures and you can take selfie and the tiny motors rotate the camera. The 48 MP selfie camera is best in class and the sensor is similar to use in Xiaomi Redmi Note 7 and it has price three times less than A80. 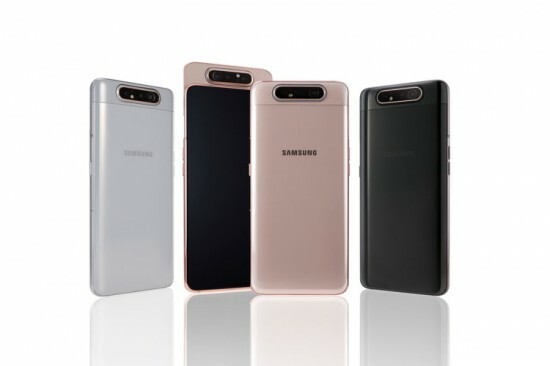 Samsung Galaxy A80 is added with 3700 mAh battery to support 25W fast charging and it does not support wireless charging. You can find this smart phone with the price tag of $730 and it will be provided in the market at the end of May.